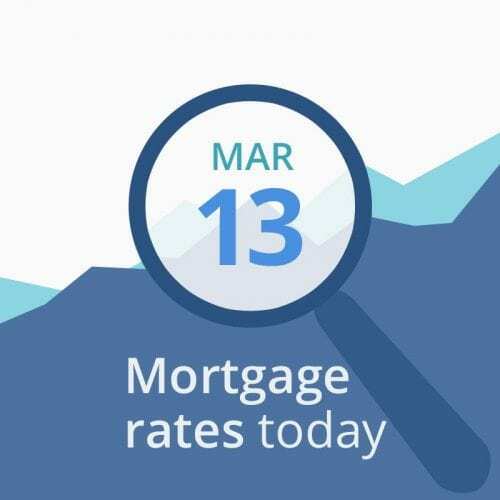 It was a good day for average mortgage rates yesterday. They fell again, this time by enough to set a recent record. You now have to go back to January 2018 to find lower rates. The sharper-than-expected drop was mostly driven by a vote in the British parliament about “Brexit,” which is the UK’s quitting of the European Union (EU). More votes are scheduled for later today, tomorrow and at other times soon, so there’s a possibility of further reactions in markets. Read on for a fuller explanation. The data below the rate table are indicative of mortgage rates rising moderately or holding steady in the short-term. But there’s plenty around, including that Brexit vote, that could disrupt that forecast. Although moderately higher mortgage rates seem on the cards at this time, that’s far from certain. As we saw yesterday, their current lack of momentum leaves markets vulnerable to triggers that can change their speed (and even direction) of travel. For example, the British parliament will be conducting a series of Brexit votes over the next few days. Those are at least as important as yesterday’s, which was the main trigger behind that day’s reduction in mortgage rates. Today’s is on a motion to rule out a “no-deal Brexit,” something most economists see as a disastrous possibility. No deal would see the UK crash out of the EU, without any agreement, forcing it to trade wholly on World Trade Organization (WTO) rules. And most expect this to lead to huge disruption to the country’s exports and imports. Indeed, many predict shortages of food and medicines and the likelihood of a UK recession or depression. And we’re talking about the world’s fifth-biggest economy here, which is why, in today’s globalized environment, American markets have to pay attention. If, as seems likely, parliament today agrees to take that no-deal scenario off the table, that would be good news. And, as you know, good news often pushes mortgage rates upwards. This morning’s Financial Times includes the headline, “Donald Trump’s trade chief warns that China talks could fail.” That may be a negotiating tactic. However, if it’s not, it could be highly significant. Because markets are increasingly focused on those U.S.-China trade talks. Both sides badly need a good outcome for similar reasons: to shore up political support at home and to step back from economic slowdowns. But markets worry those pressures will prevent a win-win conclusion — and might even result in no deal being reached or a lose-lose one. Once the talks end, markets will digest the outcome in detail. If no deal is concluded, or if the one that ‘s agreed turns out to be worse than neutral for the U.S., expect mortgage rates to tumble. But, if it’s a win-win — or even just not too terrible and simply brings uncertainty to an end — they could rise. And the Federal Open Market Committee meets next week (Mar. 19-20). That’s the Federal Reserve body that determines many interest rates. Understandably, investors and analysts will be reading the final day’s statement and watching the press conference closely. Expect market reactions if they find anything unexpected. By comparison with last week, there are fewer economic reports in the coming days. Today’s producer price index is a forward indicator of inflation, meaning it gives us insights into likely inflation rates a little in the future. Obviously, markets care greatly about such news. But this morning’s report was bang on forecast so it’s unlikely to make waves. Investors and analysts will certainly pay attention to Friday’s industrial production and capital utilization data, both of which are measures of the strength of American industry. But those are no longer top-tier indicators and expectations are already low. However, any of these reports could move markets sharply if they contain information that’s wildly different from forecasts.